Geometry is not my thing but it seems life moves in circles or repeating cycles. The Earth revolves around the sun, the moon revolves around the Earth, seasons, time, and even our own habits are cyclical. Sometimes our circular life habits become so ingrained, we lose the wonder or stimulation of life, especially when memory wanes. But we can also use these patterns to help. In honor of Pi Day later this week (3/14 because the first 3 digits of pi are 3.14), I’ve been thinking of circles, life, and patterns. (Quick-remembers what pi is? Circles are the clue-answer at the end of the post.) Life’s cyclical nature is often soothing and welcoming. Spring always follows winter, day precedes night, we are born, grow, age and die. It’s the circle of life. Details and time frames shift, but just like pi, the patterns are constant. Helping our memory can be that way too. To strengthen memory in our middle to later years, it’s important to create habits like eating brain-healthy foods, exercising our body, sleeping well, managing stress, using memory techniques and socializing. 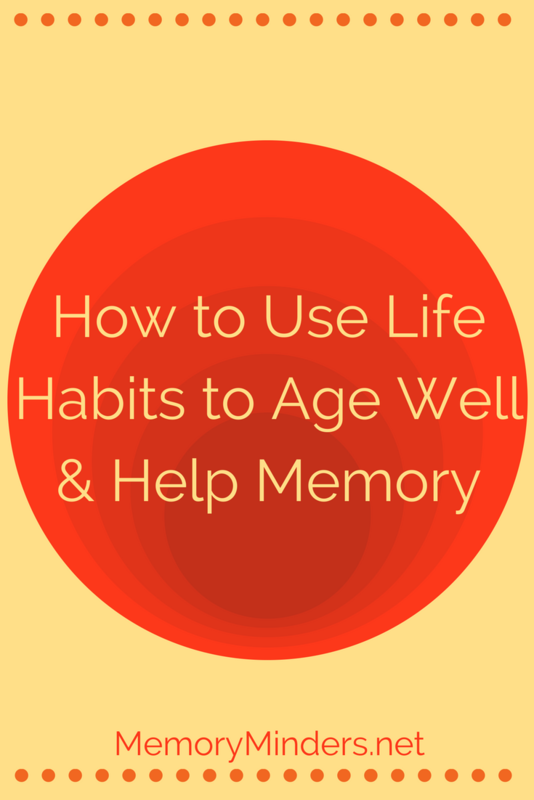 These habits help our bodies and memory age well. But what’s also extremely important is stepping out of our comfortable habits and stretching our brains. When we act and think differently than our normal routine, we use and make more brain cell connections. This strengthens our cognitive reserve and provides a solid foundation for a better memory as we age. Making patterns is good, but using our brains to learn and grow is great. Cyclical patterns make shortcuts that expend less energy once those habits are learned. These are extremely helpful in young to middle age when so much vies for our attention. However, as we get older these shortcuts cause us to use less of our brain power. If we aren’t doing anything additional to stimulate our brains, those unused areas will atrophy. The ideal goal is to utilize habits when needed, but continue to learn and grow brain cell connections. Slowly, life’s circle shifts to our later years and at times, a fading memory. It’s here when familiar or cyclical patterns can be the most comforting and helpful. Change is increasingly difficult as we age and while I advocate for learning new things to increase brainpower, too much of this is stressful and detrimental to a much older person with memory loss. So how do we balance using familiar patterns and learning new? The answer depends on the individual. For active young, middle and older adults, it’s critical to make and sustain healthy habits while continuing to learn new things. This also applies to those with very early stage memory issues without creating too much stress in the process. But for those experiencing middle to late stage memory issues, simply remembering familiar patterns is stressful and learning new can be incredibly stressful. The cycle of life is a constant pattern in our world. Understanding how to create and use life wellness patterns is useful in life’s cycle. Even more important is learning how we can use these as we care for others and/or experience our own memory changes with age. Let’s not simply observe the circles of life, but actively utilize habits in each stage to assist us! Answer: Pi is the ratio of the circumference of any circle divided by its diameter. The number Pi, denoted by the Greek letter π – pronounced ‘pie’, is one of the most common constants in all of mathematics.